JJ came to see us in the Shefa Tourism Office a couple of months after Cyclone Pam. He runs Manples Tours which provides day trips around Efate island. Like everyone else dependent on tourism for a livelihood, he was struggling. There were almost no tourists flying into Vanuatu at that point and competition was fierce for the slim pickings from the few cruise ships that were starting to return to Port Vila. JJ’s tour is very similar to the many other locally-owned round island tours, offering the same attractions and experiences. He already had brochures at the tour desks of all the major resorts and good relationships with their agents. My counterpart (the Shefa Tourism product development officer) entered his details into her database, but beyond that we were at a loss as to how to help him. As he was leaving the office, JJ tentatively asked about the possibility of building a website for his business. This was something I could do - and using an online website builder, I could do it for free. I wasn’t sure that it would get him more business given that there weren’t many tourists around, but it was worth a try. We all felt a little more hopeful. I told JJ to come back to me with his brochure and a written description of his tour. I also asked if he had any photos or testimonials from tourists that we could use. He said he did and we arranged to start working on it the following week. ​The result was a simple website comprised of five pages with some information about JJ, a map and itineraries of his tours, testimonials salvaged from a cyclone-torn visitors' book and a contact page. JJ was very pleased with it but initially (as I expected) there was no response. ​When the call for entries for the Vanuatu Tourism Awards went out, we suggested that JJ enter and guided him through the process. He was one of only three Shefa Tourism operators chosen as a finalist and feedback from the judges on his tour was invaluable. Being able to use the logo on his marketing material gave him additional credibility. JJ has since created a Facebook page for his tour and added a video to the front page of his website. He continues to get excellent TripAdvisor reviews and in challenging circumstances, to grow his business. 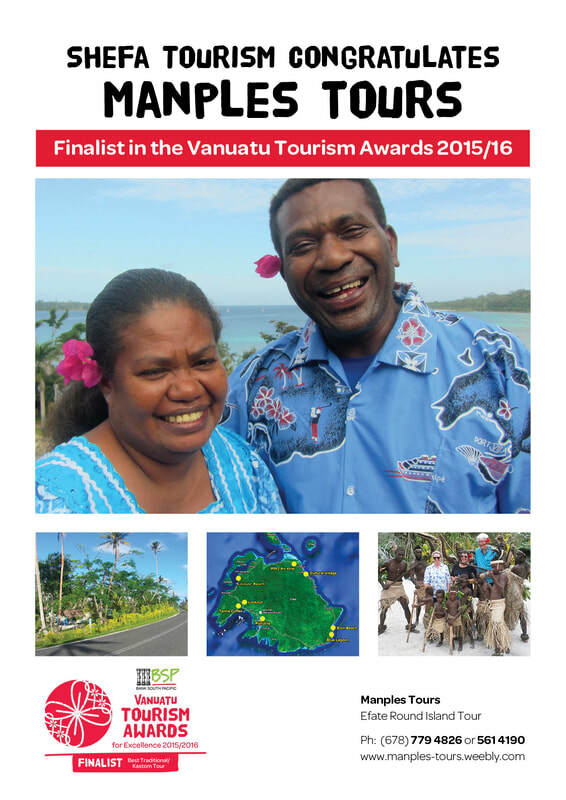 Poster designed by Shefa Tourism for Vanuatu Awards' finalists. Pictured with JJ is his wife Violet, who helps to run the tour.